RIM co-CEO Jim Balsillie is said to have been impressed and excited by the potential of Indonesia after he visited the country for a series of BlackBerry launches, according to the Jakarta Globe. The appearance of Balsillie, whose arrival was kept secret until the last moment, came as RIM launched its BlackBerry Bold 9790 and Curve 9380 and opened a retail store in the country. According to Gregory Wade, the company’s regional managing director for Asia Pacific, Indonesia made a positive impression on Balsillie. [Jim Balsillie] is so excited about Indonesia. He is enthusiastic about the entrepreneurial drive, the innovator and the apps development here. [He is] also is impressed with Indonesia’s leadership in terms of applications and social networking. He believes that Indonesia is one of the best places in the world for social networking application development. The launch was scheduled in Indonesia as a gesture of thanks towards the company’s users there. While the events were officially the reason for Balsillie’s trip, his appearance comes at a time when RIM is seeking to soothe relations with the country’s authorities. The Indonesian government did not take kindly to RIM’s intention to set up a manufacturing centre in Malaysia, insisting that — as the region’s biggest market — the base should be built in Indonesia instead. 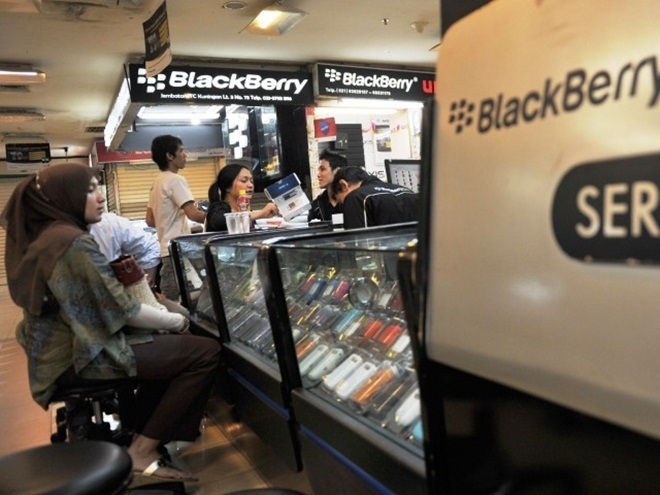 Initially, the government reacted with a threat to impose additional taxes on imported BlackBerry devices; however, it has now gone back to trying to persuade RIM to build a data centre in Indonesia, a proposal set out by authorities earlier this year. With Wade sharing details that BlackBerry’s market share in Indonesia could reach 42 percent by the end of the year, with annual shipments of 4 million, it is clearly a key market for the company. For that reason alone, irrespective of new phones and retail outlets, Balsillie’s presence and interest in the country is a sign for authorities that RIM is committed to its business in Indonesia.